Pursuant to the Act of March 3, 1865, the motto IN GOD WE TRUST was added to the reverse design inside the oval of stars above the eagle. 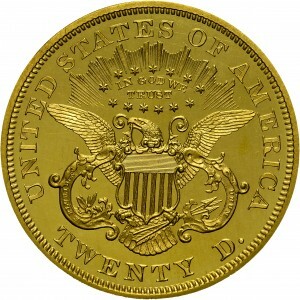 The denomination remains TWENTY D. Perhaps ten Proofs survive from a mintage of 30 coins. Of the survivors, three are currently located in museums, including examples in the American Numismatic Society and the National Numismatic Collection at the Smithsonian Institution. This gem example is one of the finest known. Purchased from Abe Kosoff, August 8, 1971. 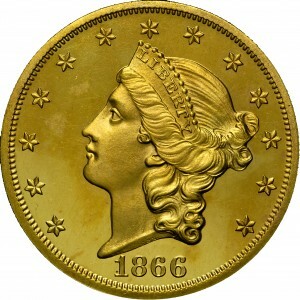 Similar to preceding, but with IN GOD WE TRUST added above the eagle on the reverse. Denomination continued to be expressed as TWENTY D.